Staten Island Semaphore Station / Optical Telegraph Signal Book: Just How Did They Communicate? 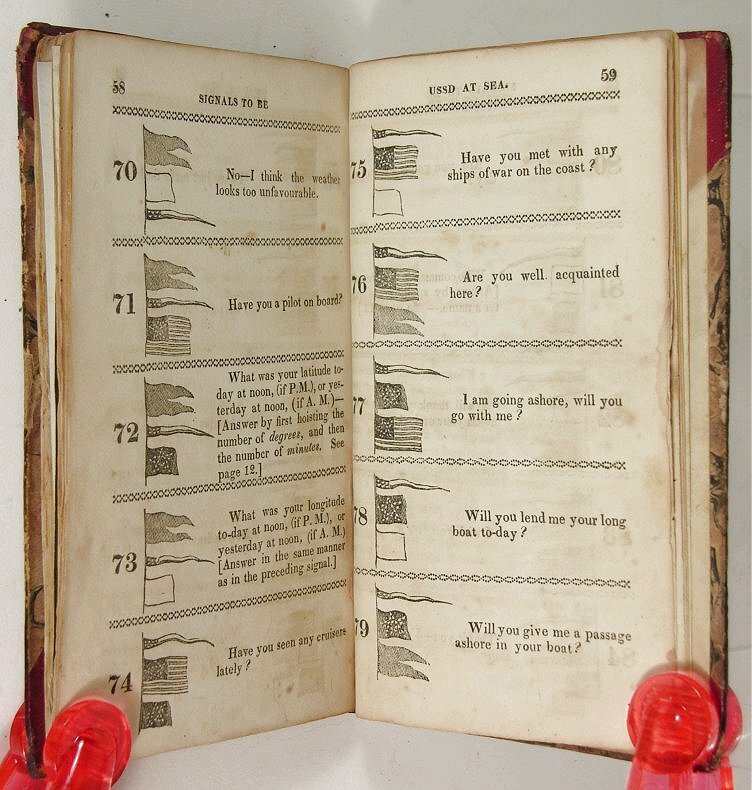 Pictured here is a fantastic, original first edition of the first comprehensive Signal Book detailing a system of communication between ships in the harbor of New York City with the Staten Island Semaphore Station / Optical Telegraph published in 1822. 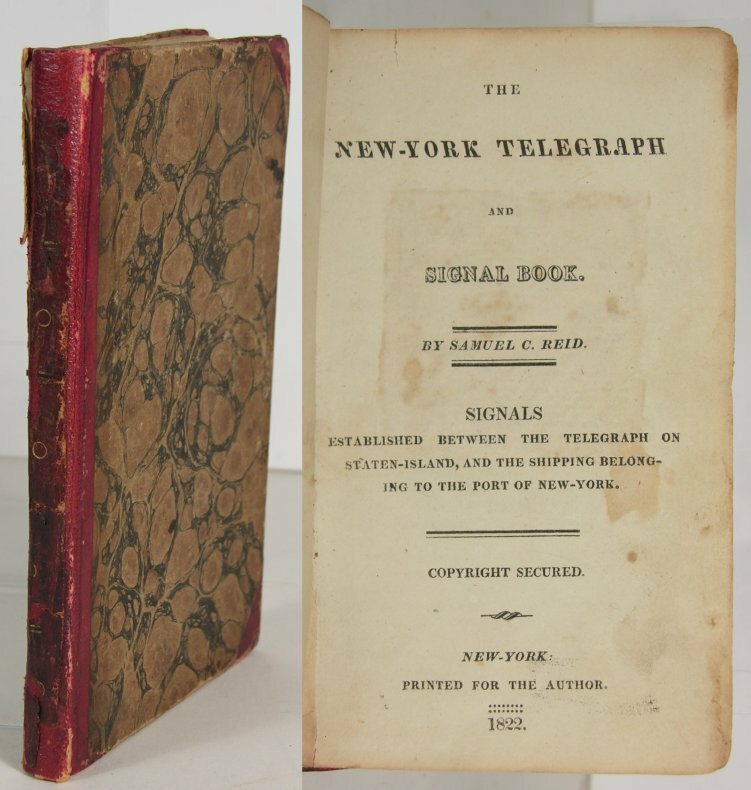 This fascinating, extensively illustrated little volume is titled “‘The New-York Telegraph and Signal Book. / Signals Established between the Telegraph on Staten-Island and the Shipping Belonging to the Port of New York”. By Samuel C. Reid. New York, 1822. “Printed For The Author”. 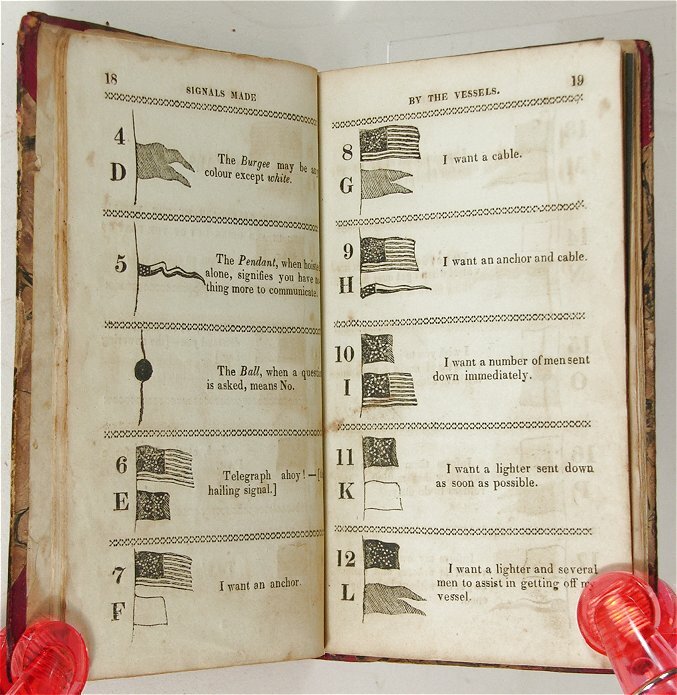 This volume is the first published “code-book” relating to telecommunications in the United States and is one of only 3 known copies in existence (Worldcat finds one example at Harvard’s Houghton Library and one other held by the Peabody Essex Museum). 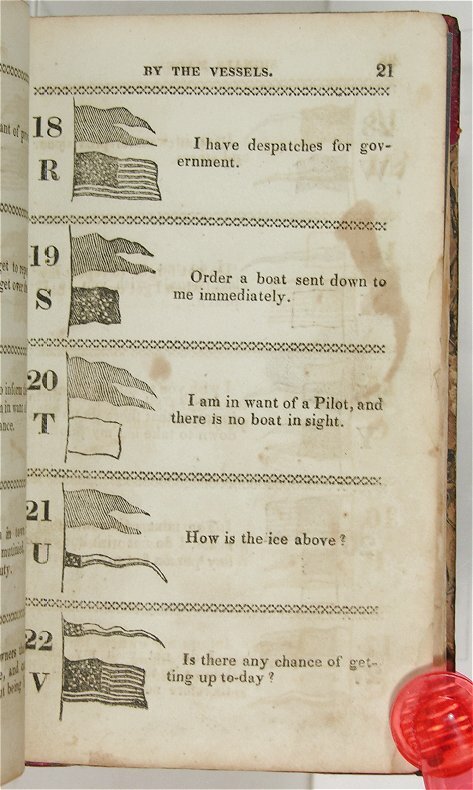 The system of communication was devised and this Volume written by Samuel Chester Reid, an officer in the United States Navy who commanded a privateer during the War of 1812. He is also noted as having submitted to Congress the design of the flag of the United States, which first established the rule of keeping thirteen stripes and adding one star for each U.S. state in 1818. Reid’s design is still in use today. This exceptionally rare, Merchant Shipping / Nautical Code Volume measures approx. 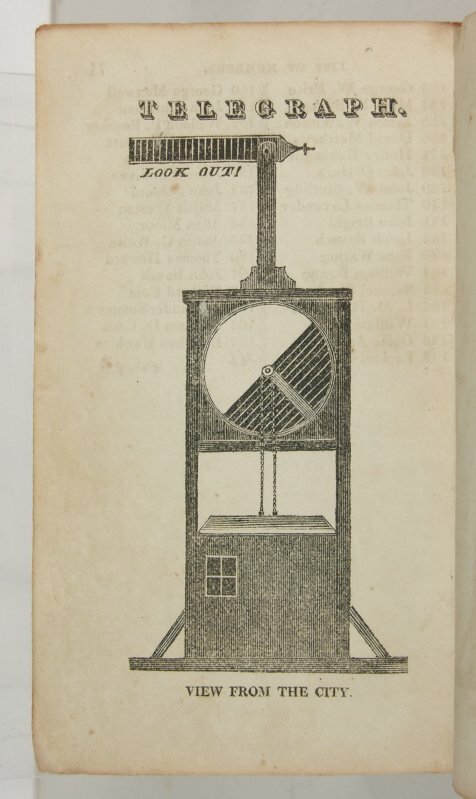 3 3/4” by 6” and contains 72 profusely illustrated pages. 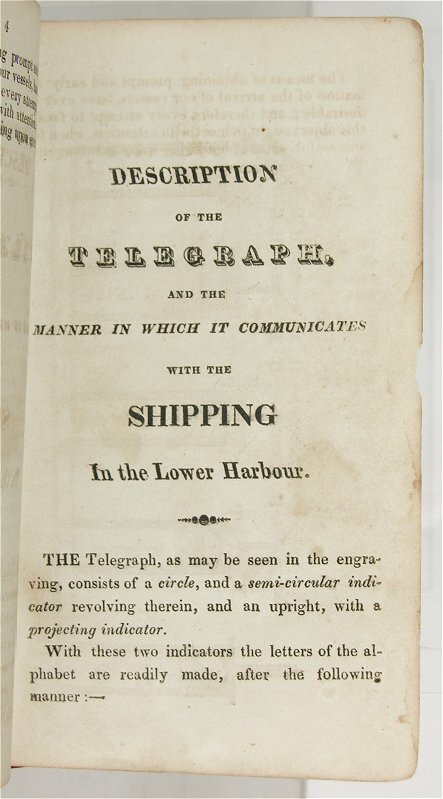 The first section of the Volume is titled “Description of the Telegraph and the Manner in Which it Communicates With the Shipping in the Lower Harbour”. These 11 pages detail (with text and illustrations) the form and function of the Optical Telegraph located at Sandy Hook on Staten Island which was used to relay messages to and from ships entering the harbor of New York and the Merchants’ Exchange Building in Manhattan. 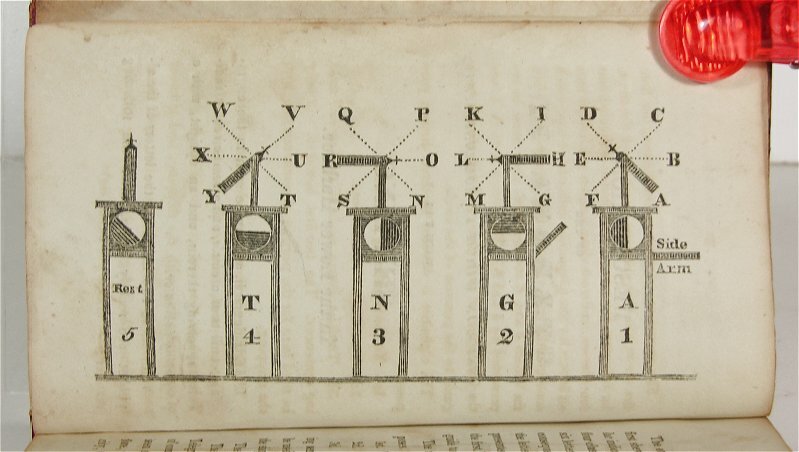 Within these first pages there is a complete detailing of the positions of the mechanical parts of the Telegraph that represent each letter of the alphabet. 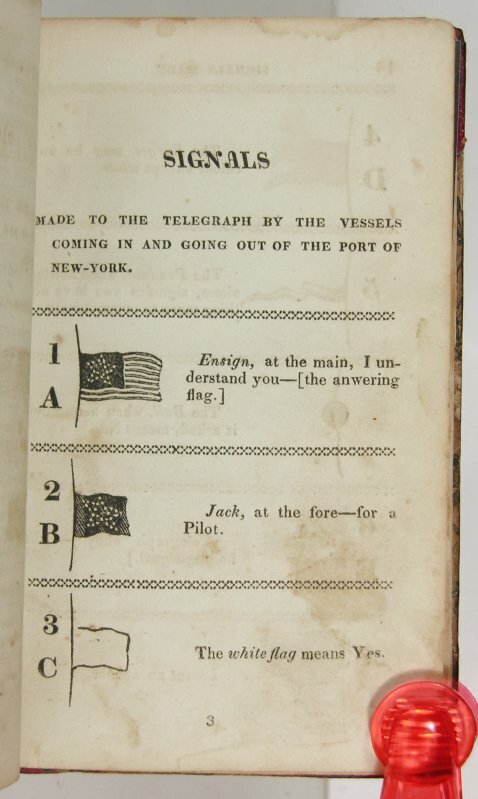 The text tell of the manner in which the Telegraph first identifies which ship it wishes to communicate with (New York’s lower harbor was a busy place in 1822 with many ships coming and going), the manner in which the subsequent communication is to be made and the manner in which the ship would be able to communicate with the Telegraph Station. 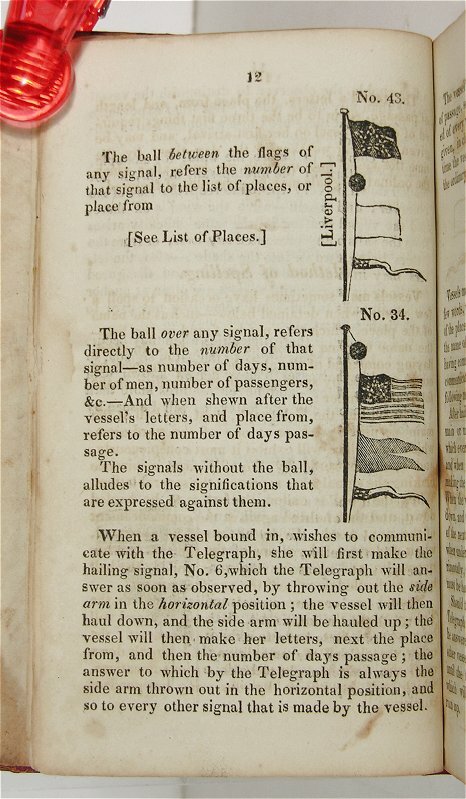 Of special interest in this Volume are the next 52 pages titled “Signals” which presents a VERY detailed code to be used by the Vessels when communicating with the Telegraph. By the use of a combination of flags commonly found on all merchant ships along with a black ball, a vast array of information can be conveyed through vertical combinations of the signal flags and ball flown from the flag staff or other pole. The ships ensign (in most cases a variation of the National Flag), the jack, pendant and burgee along with a square white flag and the black ball were all that was need to communicate everything from “I want a cable” to “I have several persons on board taken from a wreck” to “My crew is so exhausted that they are unable to work the vessel up”. There are specific communications meant to be relayed to the individual ship’s owners as well as general news and communications and specific needs and desires of the ship’s masters and crew. Each message is illustrated with the combinations of flags and ball that represent that message and these illustrations use the flags of an American vessels – hence the American Naval Flag, the star jack and the American Flag form pennant!! This exceptionally rare and wonderful Volume is a treasure trove on information regarding the state of the U.S. Merchant Marine Fleet of the early 19th century as well as a fantastic insight into what types of communication were deemed important and how that information was communicated in the years before ship to shore telegraph / radio. Also included are “signals” that could be used by the ships in the harbor to communicate with each other!! 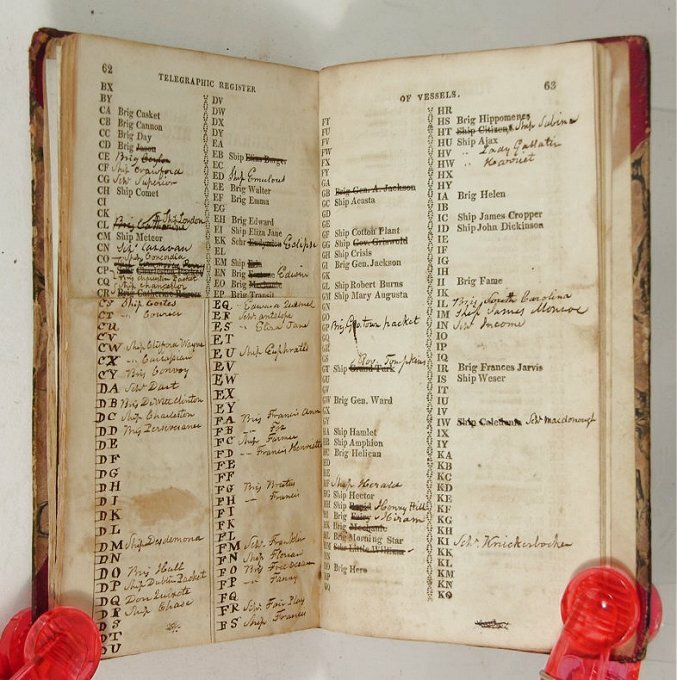 At the back of the Volume is a “Telegraphic List of Vessels” which is a part printed and part manuscript list of all of the American Merchant Ships along with their one or two letter designation for identification and communication purposes. 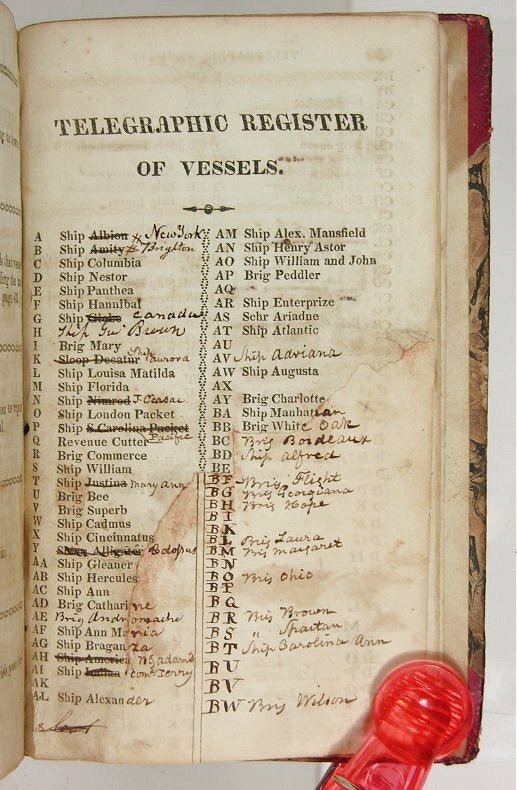 The list is extensive with many Ships and Brigs printed into the original work but with many of the two letter designations left bland and with the names of other ships added in manuscript as they joined the merchant fleet. This historically important Volume is bound in its original half red leather and marble boards which are intact and sound with some edge wear and a partial split at the bottom of the front hinge. There is extensive, period manuscript entries in the List of vessels at the rear that appear to be all in the same hand. This entry was posted in Past Auction. Bookmark the permalink.